Users love Single Sign-On, but we’ve found the depth and quality of a Marketplace app's integration with Google Apps is a key factor in both the user experience and vendor success in the Marketplace. Deep integration makes users happy, because it helps them avoid entering duplicate data and makes useful information accessible from their day-to-day communication and collaboration tools. To help you discover ways to integrate your own applications with Google Apps, we added a new section to our developer docs showcasing examples from popular applications in the marketplace. Some examples, like BatchBook’s streamlined sign-up process for users, show simple ways applications can help users get started quicker. Apps can help users be more productive by displaying information and allowing them to take action right within an e-mail message. 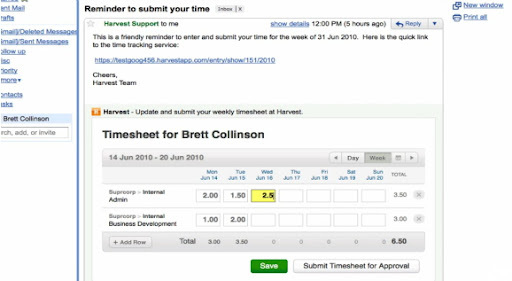 Harvest, a time tracking application, allows users to complete their timesheets in gmail when they receive their weekly reminders. You’ll also find examples for collaboration and document sharing, such as Manymoon’s seamless integration with Google Docs. 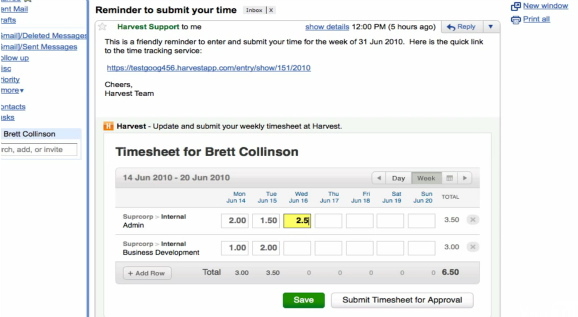 This makes it easy for users to share information with teams or attach relevant docs to tasks. You can read more about these and other integrations, or try out the apps yourself by going to the Google Apps Marketplace. Of course these are just a few of many ways to make apps easier for users, and we look forward to seeing even more creative ideas from developers. P.S. If you want to learn about the APIs which enable these deep integrations, meet with fellow developers and ask questions of Googlers, come to our Google Apps and Apps Marketplace Hackathon at the Google Mountain View campus on August 24th!